The conservation status of species in Slovenia shows that only about a quarter of species’ show a favourable status. Furthermore, the trends are unfavourable. Even though the proportion of species showing a favourable conservation status increased in the period 2008–2012, the proportion of species showing a poor conservation status also increased. In order to achieve the objectives of the strategy, its guidelines must be consistently taken into account, while the adopted programmes and management plans of protected areas must be implemented. a large enough habitat exists (and will continue to exist) for the long-term conservation of populations of a certain species. The conservation status of a species is thus used to measure impacts on an individual species, which can have a long-term effect on the size and distribution of its populations. 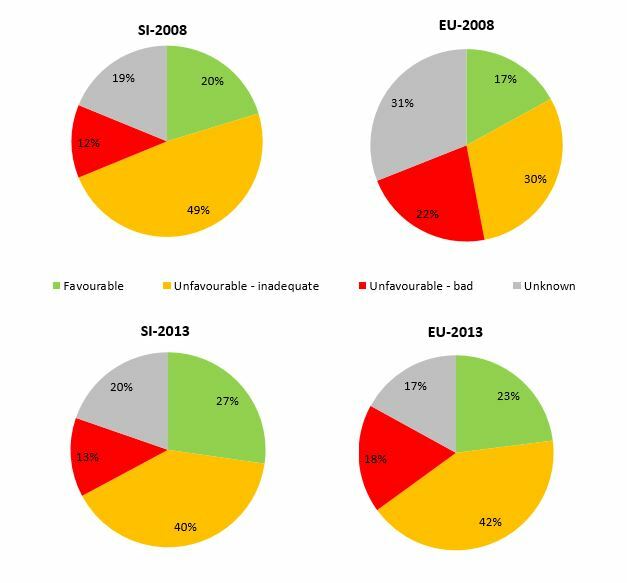 State of nature in the EU – results from reporting under the nature directives 2007-2012. EEA Technical report No 2/2015. The conservation status of most species of European interest in Slovenia is unfavourable. Only 27% of species (which is 4% more than in the EU as a whole), were assessed as having favourable conservation status. Compared to 2008, the share of species whose status was assessed as favourable increased by 7%. However, the share of species whose status was assessed as poor increased as well. The main reason for unfavourable conservation status in Slovenia is loss of habitat, caused by humans through unsustainable management and spatial development. 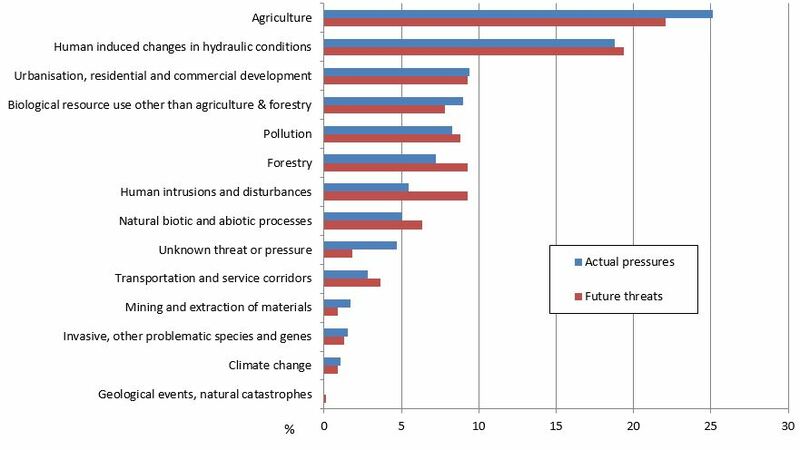 Due to inappropriate agricultural practices and anthropogenic impacts on the aquatic ecosystem, the worst conservation status has been found among arthropod species (crustaceans, butterflies, beetles and dragonflies), amphibians and fish. The trend for these species is also unfavourable. Favourable conservation status has been observed mostly in species' belonging to ferns and seed-bearing plants (>50 %). Compared to Slovenia, the conservation status of species at the EU level is somewhat worse. 18% of species have been found to have poor status. Like in Slovenia, the share of species assessed to be of favourable conservation status has increased over the last six years. For a fifth of species in Slovenia (3% more than at the EU level), conservation status has not been assessed due to a lack of data. 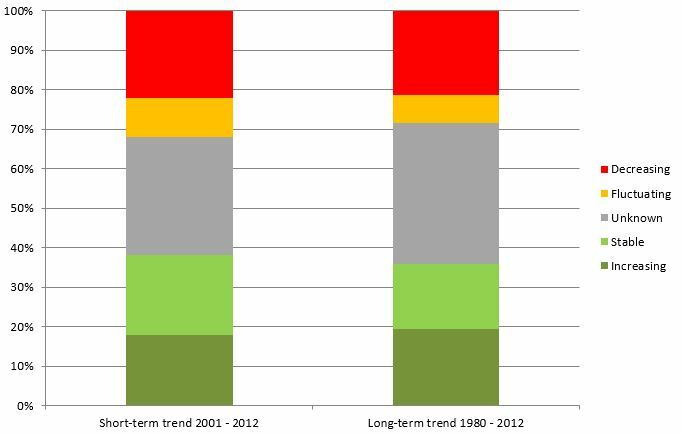 More than one fifth of populations of song birds of European interest in Slovenia have a negative short-term and/or long-term trend. 38% of populations have a stable or positive short-term trend, while 35% of populations have a stable or positive long-term trend. One fourth of breeding populations have a negative short-term trend and one fifth has a negative long-term trend. 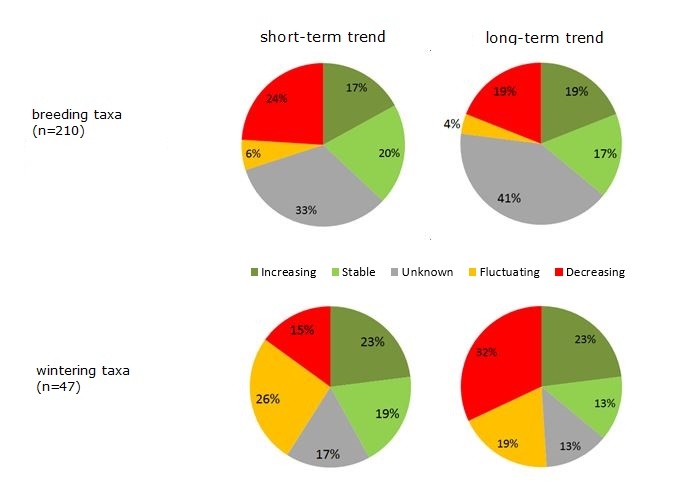 One third of wintering populations in Slovenia have a negative long-term trend, while a negative short-term trend was determined for only 15% of populations.